St Cast le Guildo is a lively yet authentic Breton port town. It combines all that is good about a modern tourist destination (great leisure facilities, good local amenities etc.) with a wonderful heritage and history, and offers the charm and atmosphere of an old French port town along with the lively buzz of a town where everybody can find something to interest them... young and old alike. St Cast le Guildo leaves no one stuck for something to do. A town where the tourists arrive in their droves in the summer holiday months of July and August needs to supply plenty of diversions, and St Cast le Guildo does not disappoint. Even if you have tired of the simple sights and sounds of the harbour or the pleasures of a day on one of the seven beautiful beaches, you will still find enough to do to keep you in St Cast le Guildo for many days to come (whatever the weather!). St Cast le Guildo has great shopping, lots of good restaurants (with fish and shellfish being particular specialities you will not be surprised to hear!) plus a cinema, some historical monuments and a ruined castle. St Cast le Guildo has so much to offer in the way of sporting opportunities that there is no excuse at all to lie around... except, perhaps, for the amount of superb food and drink that is available here to tempt you! In or within easy reach of St Cast le Guildo you can find an eighteen-hole golf course, an equestrian centre, a trail riding centre, a sailing school, an indoor sea water swimming pool, campsites, hotels, restaurants, bars and cafés. Not to mention the miles and miles of walking trails tracing the dramatic and beautiful Breton coastline and celebrating its fabulous flora and fauna. If you want to explore a little further afield, there is plenty of choice is open to you using St Cast le Guildo as a base. St Cast le Guildo is close to the gorgeous mediaeval town of Dinard, with its impressive ramparts and ancient cobbled streets, and it is also within easy reach of the bustling port of St Malo, excellent for shopping and well worth discovering. The nearest international airport is at Dinard, and you can fly there direct with Ryanair or Aurigny Air. Those who like to travel by boat (and it is always good to have a car so that you can easily explore more of this fascinating region) can take a ferry to St Malo. The property market in Brittany, particularly in coastal Brittany, is always strong, so don't expect prices to be low in and around St Cast le Guildo. It's a desirable town in a desirable department, but if you do make the investment it should prove to be a good one, with prices holding and increasing over time, and the rental market for holiday property continuing to develop. Do you know Saint Cast le Guildo better than we do? Do you have photos of Saint Cast le Guildo? WHERE IS Saint Cast le Guildo? Saint Cast le Guildo is located in north-western France. It lies on the coast in the very north-east of the Côtes-d'Armor department. 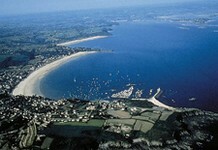 Access: By air: Fly to Dinard, with Ryanair or Aurigny Air Services. By boat: The nearest ferry port is that of St Malo. Economy: Tourism is a major force in the economy, but the deep water port is also significant as the big trawlers can come in with their loads of freshly caught fish. Interesting fact: Saint Cast le Guildo has been a popular seaside resort since the 19th century.